This week has been wonderfully warm and sunny. I declare it’s spring. But tell that to the produce aisles in the supermarkets and grocery stores. They are still full of winter vegetables! So here’s one last winter recipe for you which features some very German but at the same time very international ingredients: cabbage and potatoes. 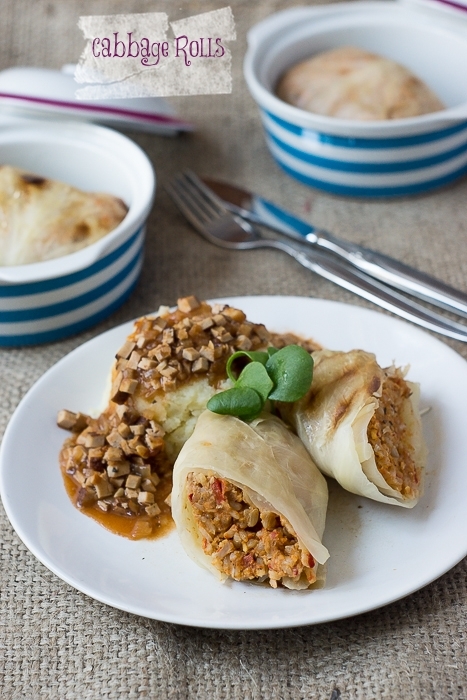 Cabbage rolls are a traditional German dish. If you look at ingredients and appearance it’s pretty clear what German cooking is about: Maximum meat and potatoes on a plate and please hide those vegetables! I think the cabbage is doing pretty good here in its pale camouflage costume, isn’t it? Let’s face it, traditional cabbage rolls are ugly. They will probably not pop up in one of those fancy lifestyle magazines or on our favourite pretty pink and clean Pinterest boards. And what a pain they are to prepare! How the heck do you deal with that whole head of cabbage and transform its leaves into neat wrappers for the filling? Well, all these concerns and complaints are totally valid. But cabbage rolls are also pretty damn delicious! Especially if you fill them with rice, tempeh, and peanuts and top them off with “bacon” sauce. And about that cabbage: it’s really easy to peel off the leaves and keep them perfectly intact if you just blanch the whole head in a large pot. And don’t worry about any leftover cabbage leaves! I have a solution for that, too! * In Germany tempeh often comes in 7 oz packages. If you have an 8 oz package, you can use the whole thing. Place the rice in a pot and add 2 cups of vegetable broth or water. Bring to a boil and simmer until done. Add some more water if necessary. Add some water to a large pot with a steaming basket. Bring to a boil and add the cabbage head. Cover with a lid and steam for 5 minutes. Wear mitts to protect your hands and then cut off the two outer leaves. Use a fork to peel them off. This should be very easy. If not, steam the cabbage a bit longer and set them aside to cool. (I placed them in a large metal bowl.) Cut off 10 more leaves and set them aside. 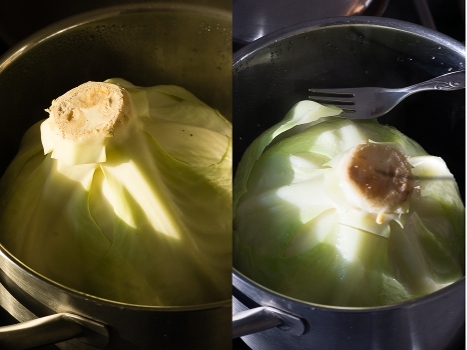 You should always steam the cabbage a bit more in between, so that the leaves are easier to peel off. I steamed it 2-3 minutes before peeling off another 2 leaves. Store the leftover cabbage in a fridge. I’ll post a recipe for a cabbage stew in a day or two so you can use it up. You could also try this recipe for another cabbage stew that’s already up. Place the tempeh in the pot and steam for 10 minutes, too. This should get rid of any bitterness. Set the tempeh aside to cool. Add one tablespoon of oil to a large pan. Add onion and bell pepper and brown for 5-7 minutes. Crumble the tempeh into the pan, add thyme, salt and pepper and stir. Fry for 5 minutes. Place 1/3 cup broth and the peanuts in a blender. Add tempeh mixture and pulse. The mixture doesn’t have to be completely smooth, a few bits of peanuts and peppers are ok.
Add the cooked rice to a large bowl and mix with the contents of the blender. Add soy sauce, paprika, and season with salt and pepper again. Preheat oven to 200°C (400°F). Have ready a baking dish that can accommodate 6 large cabbage rolls or use two smaller ones. Place one cabbage leave on your working surface and place 1/6 of the filling in the centre. Fold over the edges and wrap up. (It’s like burrito wrapping!) Place the cabbage roll with the seam side down on a second leave and repeat. Place the roll on your prepared baking dish and repeat this with the remaining cabbage rolls. Pour the broth into the dish. (I used two dishes and divided the broth between the two.) Cover with foil and bake for 45 minutes. Remove foil and bake or broil for another 15 minutes or until the tops start to brown a bit. While the rolls are baking prepare the mashed potatoes and the “bacon” sauce. Peel the potatoes, quarter them and place in a large pot with enough salt water to cover them generously. Boil for 20-25 minutes or until soft. Drain them. Add soy milk and oil to the pot you just boiled the potatoes in. Heat the mixture. (It’s not necessary that it boils.) Add potatoes, mash with a fork or potato masher and make sure to incorporate the liquid well. A few small bits of unmashed potatoes are totally okay! I love my mashed potatoes that way. Add onion and oil to a small pan and caramelise the onion. When it’s nicely browned, add the tofu and fry until crispy. Add tomato paste, flour, vegetable broth, and red wine. Stir until the tomato paste is dissolved. Add herbs and cook for 5 minutes or until the sauce has thickened a bit. Once your cabbage rolls are done, serve with mashed potatoes and sauce. The whole dish will serve four to six people. Those cabbage rolls look so pickupandscoffable! Peanuts and tempeh..swoon! Love the idea of the ‘bacon’ sauce too. I’m trying these soon..doesn’t matter that it is 27degrees. I need a cabbage roll now!